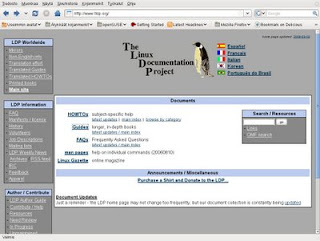 All of us who use Linux should in my opinion regularly browse through the pages of the Linux Documentation Project. TLDP offers a great collection of free documentation in different formats and even in translations in many languages. Some of the documentation is already pretty old. But we who want to use linux with an old computer might still find interesting bits of information even in the oldest guides. What about reading 4mb Laptop HOWTO by Bruce Richardson (2000)? Or something newer like The Mock Mainframe Mini-HOWTO by Scot W. Stevenson (updated 2005)? In addition to HOW-TO documents, TLDP offers longer in-depth guides about different aspects of using Linux. I'm sure everyone finds something interesting in this wonderful collection of documentation. What is your favourite?